Is this type of install done a lot and does it save a bunch? He needs to go back over those courses. I cant talk to the legality of using a hot water heater for heating but He missed the "pumping away" lessons and is pumping to the expansion tank. Another hydronic expert is born…. He is missing the boat on a BUNCH of stuff. Promoting the use of open potable water systems for space heating is akin to playing Russian Roulette with the health of his loved ones. As a survivor of Legionaires disease, I wouldn't wish this upon my worst enemy. He's headed in the right direction by going hydronic radiant, but he needs to finish doing his homework before he goes public with this and convinces a bunch of other people that his idea will work, and not compromise their families health. I am intimately familiar with two other people who contracted this deadly disease (Legionella) from systems EXACTLY like he is talking about. And that doesn't include me. I got mine from a water heater that was simply set too low. And in the interest of full disclosure, I actually DID install one of these systems in my own home many years ago, and the performance sucked. I eventually replaced it with a real closed loop system, and in the process, when I was cutting the old stuff out, there was a bluish green ooey gooey slime that came out of the pipes. It's called bio film (food and shelter for bacteria) in scientific circles. I'd NEVER intentionally expose anyone to that mess, and if he were smart, he'd do research on Legionella Pneumophila and quit promoting this deadly, CHEAP method. Unless things have changed and I am unaware of it, it was my understanding that tank-less water heater manufacturers do not list their water heaters to be used as boilers for heating. They don't have that great big "H" on them. If the heaters fail under warranty, the warranty will not be honored. The problem was so bad from installers improperly installing water heaters as boilers, that manufacturers started putting domestic hot water tanks in their boilers. Any "green" or "homeowner" can do anything they want, and not be code compliant because the work is never inspected. Or inspected by some AHJ who only collects the inspectional fee and is clueless about current code requirements..
Just because you can do something, doesn't mean that you know what you are doing or that it is correct. If you're so good at fitting pipes together, why don't you go into business like many of us here are. Anyone can go to PEX Supply and buy a bunch of stock. When it doesn't work, they come here for advice. Mr. Mustache, that looks like an attractive installation. If you did the piping and installation without any help, you belong in business competing with us. Not leading unsuspecting consumers down a path that will cost them. Don't do it. Just because someone can do it, doesn't mean it is right. Open hydronics systems like that one are illegal in most places and are breeding ground for Legionella as well a host of other issues. The tankless water heater is not designed, controlled or approved for space heating. It also will have no warranty if installed like that and probably won't last 3 years. There are reasons why things like delta T, gpm, head loss, btu's, emitter output, R values, etc, are involved in doing radiant heating: they are necessary to providing a reliable, comfortable and legal heating system. And there's no magical DIY way to getting around them. If there were, we'd be doing it. You don't go to an auto mechanic for a root canal and GC has no business passing himself off as a hydronic designer whose advice can be trusted. He ought to be sued for practicing hydronics without a license. Every error that he's advocating is based on doing it cheap, rather than correctly. A person that follows his mis-guided advice will soon find that the laws of physics out weigh the laws of economics - every time. Someone once told me that it is a fleet of ships about that Legionella stuff. I told them that the CDC has a whole Armada of information on it and I hoped that no one he worked for ever got it because it was going to cost them dearly. Thanks for the story and qualification ME. It can happen to anyone. Tell them about the critters that live in shower heads that come out in the aerosol mist that don't seem to effect men but seriously effect women. Can't remember the name. Its a serious problem in Nursing Homes where the maximum water temperature to residents rooms are 112 degrees. 106 being ideal. boiler, DWH etc. A friend of mine (who I was advocating hot water heat too) sent me this website as he checks MMM very frequently so I started this thread with it and all on the Wall replied with some good info. I too noticed that this thread has been linked on MMM's website. Actually water heaters, tankless included as long as its used as a combi system is not illegal in most places for heating, and approved by the manufacturers. Not that I agree, with the true combi boilers that are available today that segregate the two circuits, why do it? But you cant stop the tankless unit use in a combi application. What I whole heartily don't agree with is a water heater applied to anything else but an air handler with a hydronic coil that has some built in protections such as higher heat operation and coil purging. Putting a water heater on a radiant system with all the added mass of stagnate water is asking for trouble, odors and dangerous exposures to potential illness. BTW, that house looks to big to be heated with that number of loops, pipe size and tankless flow restriction. some good info and great photos there. I like to tell people that while it is possible to safely use an approved tankless water heater for space heating, that by the time they add the buffer tank, ODR-controlled mixing valve, and (for combi systems) heat exchanger which will allow it to deliver comfort, they will spend less on a properly-sized mod/con boiler. It will also use more fuel than the mod/con. I used to get my gall bladder out at hospitals but after seeing all the scary instruments and hoses I am self performing any future surguries and will sketch out some diagrams so my friends and neighbors can get in on this cost saving alternative. I mean really. How hard is it? Nice job MM insulting the trade. Maybe you can do like Mr. Mustache and get all of us a group rate on surgical supplies, anesthesia, pain meds and bed pans too? and mostly covers the bases. > A comprehensive control strategy needs to be developed and tested to optimize the control of heating pump flow, air handler flow, and TWH heating output, to control on heating water return temperature, heating SAT, and DHW supply temperature to better optimize and monitor efficiency and comfort of specific combination systems. Last time I checked, much of this hardware and software were included with the best of current mod/con boilers. > There are really no standards or peer-reviewed guides for efficient combination system design. Most systems are designed and installed by trial-and-error “experts” from smaller independent heating system companies. Not really sure what to say here. Fan of cradle to grave thinking so after the sketches of various simple operations, I will have an addendum of simple embalming or cremation procedures for all to share. They are developing a new standard (CSA P.9-11) that makes sense, we shall hear or see it soon or something similar in the states. They do this stuff a lot in Canada with the small tight homes they live in. Ha ha! You think that plumbing and human surgery are equally difficult? I think there's a reason why you just need a certain amount of experience + a written exam to become a plumber, and you need years of training and advanced degrees to become a surgeon. Lot of negative/angry responses here! If you are concerned, why not go over to the comments section on that blog and post your concerns and possible solutions? Re: Legionnaire's Disease. Would the tankless heater not heat the water enough to destroy bacteria before going to the house? I note the hot water supply comes directly from the water heater to fixtures. Could the Rheem not heat the water to the required 140 degrees to destroy the bacteria, then temper with cooler water on the way to the fixture? That way, the water would be first sterilized before going to the heating loops, and then if anything developed in the heating loops, it would be re-sterilized before being used for domestic hot water. Am I missing something here? It doesn't make sense. We all want to save where we can. In fact, we'd all like to get it for free. But anyone with some life experience and a little comon sense has come to realize that you get what you pay for and cutting corners costs more in the long run than doing it right to begin with. Anyone that would build a house that includes radiant should realize that's the Cadilac of heating systems and you're not gonna get that kind of quality by throwing it together with Yugo parts. In my opinion, Mr. Mustache is preying upon people's technical ignorance and their natural desire to save money for the sole purpose of promoting himself and his own business interests. In other words, he's an internet snake oil salesman. How can any other conclusion be drawn when he's stated that he knows there's extensive knowledge and design required for these systems but he's found a back door around all that? He even posted a pic of a correctly designed and installed system as well as his hack job diagram. No, he can't plead ignorance. What other conclusion is there? Secondly, Legionella aside, a host of issues with open systems have been laid out here, in this thread and many others - issues that put into question both the touted efficiency and the cost-effectiveness (due to longevity issues) of such systems. Thirdly, as a do-it-yourselfer who chose to do his homework rather than rationalize not doing them properly along the lines of "if it exceeds my attention span or my budget, it must not be worthwhile", I have found the professionals (and other do-it-yourselfers!) here to be very generous with their time and advice, and any negativity expressed toward Mr. Moustache would have to do with the casual way in which he rejects knowledge out of hand and not with elitism or the impulse to protect their livelihood. Weighing costs and benefits, something that every design (especially on a tight budget) should have a lot of, involves considerably more mental effort and discipline than Mr. Moustache seems to have afforded his project, and the health of his wallet and his family might be the worse for it. is I did not expect this to get as much attention as it has. That being said all of these guys/gals (on the wall) are very experienced and I don't think the argument was a plumber is smarter than a doctor or vice versa, (I don't know haw many doctors can read a pump curve, or how plumbers can remove a gall balder). The point and somewhat valid is you get what you pay for (many companies have low overhead, operate efficiently etc...) But the real point now; is the system safe, correct and efficient. Sounds like no, no, no. So instead of these highly skilled mechanics, engineers plumbers, contractors (with advanced degrees), giving advice on that blog let the designer learn the ins and outs of his mistake(s) and ask later or let the designer scan the infinite wealth of knowledge on this wall and do the research himself. No one said they were equally difficult. It was simply an analogy to convey a point. Obviously, it was lost on you. Also, we're not talking about "plumbing". We are talking about Hydronics. And radiant floor heat in particular. Something most plumbers and HVAC people are clueless about. Then along comes Mr. Mustache, a GC, passing himself off as an expert in a field that he's woefully ignorant of and plying his ideas upon trusting people who take his advice as though he's some guru. If you think this just involves learning to put pipes together and passing a written exam, then you're very much in the dark. Mark Eatherton has over thirty five years experience and is president of the Radiant Panel Association, the nationally recognized authority on radiant heating. He has personally contracted Legionella and survived it. Therefore, he is passionate about its prevention. Ice sailor has about 50 years experience in this trade. I think he brings a little more to the table than just putting pipes together. I have over forty years experience, masters licenses in five trades and five years of college. Others here could list similar qualifications. We contribute here for free out of our own time because we want to help others by giving back to an industry that has benefited us. Seeing bad advice being given to others that we know will result in serious problems and maybe even death is not something we're gonna let slide. It will be vigorously addressed and refuted. If that bothers you, too bad. You would do well to educate yourself a little before you come here hurling accusations and defending blatant and willful error. Most, if not all of the men on here are gracious and willing to educate and help others about our industry if approached with the right spirit. But if you come hurling stones, don't be surprised when the response is a mortar round. I'll be volunteering to perform radiant colonoscopies to proponents of open systems...without lube or anesthesia. I understood the point; I simply didn't agree that it was a valid one. I was pointing out the ridiculousness of comparing installing a radiant heating system in your house to doing surgery on yourself. Obviously the two are on a whole separate playing field. Extend the analogy, and you'll be saying no moron should cook their own food - everyone knows you should hire a professional chef! They have years of experience, after all. And mowing your own lawn? Insanity! Think what could happen if some idiotic untrained lawnmower operator ran over his own foot! No, that is definitely a job for the professional landscapers only! The commenter above made snide, sarcastic remarks suggesting that anyone who even tries to install their own system must be a complete moron because it is so complicated that it is beyond the grasp of anyone but the most highly trained and experienced people (like surgery). I accept that experience is a benefit here, and that the poster may have more to learn, but I do not accept that anyone without experience in something deserves to be ridiculed for even attempting it. That's how you get experience, after all. The person in question here is an engineer and probably neither stupid nor incompetent. He is installing a system that is accepted and in fact recommended by various manufacturers and installers. If you disagree or have concerns, say so. If you want to get really radical you could even offer solutions. Throwing around personal insults and making fun of someone who knows less than you is not constructive. Maybe most of the people here are gracious and willing to educate, but that's certainly not the attitude I see on this thread. Hmm, I did look up legionella and found that 140 degree temp required to kill it... Just looked it up again and I'm still seeing from other sources that water can be disinfected of legionella at 60C/140F. Is your concern that it's not held at that temperature for long enough in a tankless system? I 'm not sure where your criticism is coming from about "the casual way in which he rejects knowledge out of hand". What knowledge has he rejected? As far as I can see, no one is over there pointing out flaws and getting shot down. He designed this system in consultation with the pros, had it approved by a professional system designer, and then posted it publicly and invited people to critique it. He's already made one correction to the system based on advice from the comments. You may not agree with the conclusions he came to, but I don't think that suggests that no mental effort was put into it. As a retired millionaire who runs this blog for charity and to help people improve their lives and reduce their environmental impact, I don't think that's his purpose. I think he's trying to promote a way to make an environmentally friendly technology more accessible and encourage greater adoption and, you know, help people. He's using himself as the guinea pig to try to come up with a simpler system that is safe, efficient and effective, yet less expensive and more manageable for the DIY-er, because he advocates lifelong learning and hard work rather than outsourcing the things you need to do. I will refrain from responding to your post the way I would like to. The people on this site are here to HELP other people. As this is your first day on this site, I can only conclude that you are in some way related to the MMM site as you are only condoning poor practices. The only comments that I have seen on this post (other than yours), were made to ensure a safe and functional system. As there is a link to this site posted on MMM I don't think that it is anyone's responsibility to go there and correct the system that he designed and will not work nor be safe. If MMM wishes to learn about the correct way to install a radiant system, he should come here and find out how to do it , The folks here would be more than happy to help him. All he is doing is showing people how to do something the wrong way, with the wrong equipment and it will only cost them more money down the road as they will have to pay an experienced pro or allot of time and effort on their part to correct it. I would rather have many of the folks that lurk here remove my gall bladder than some of the doctors (or engineers) that I have dealt with. Maybe after he discovers all that he can go back on the blog, admit his mistakes and offer to compensate all that followed his example with his millions? I didn't mean to offend anyone. I am indeed an MMM reader and I am planning on putting a radiant in-floor heating system in the house I'll be building in a couple of years. Someone posted a link to this thread and I thought, hey, that's probably a great resource, I'll have a look! But what I found was mostly people bashing MMM and suggesting he was a con-artist and/or a moron, that open systems are totally unacceptable (yet I've seen them recommended by companies that specialize in this) and saying only the professionals can handle this type of thing - DIYers need not apply. Yet no one seems to have pointed out problems in the system that render it unuseable. Some have said another type of system is better, but for a low-cost and simple, DIY-maintainable system, is this unworkable? It doesn't seem that way, as far as I can tell, and therefore I don't think the original post at MMM is anything evil or misleading. The concerns identified so far are Legionnaire's disease (this can be addressed, as far as I can see), building code requirements (not really a system problem - MMM can take care of this, I'm sure), the possibility that the water heater will not last and will not be covered under warranty (this is experimental, so if it fails, that will be valuable feedback MMM can pass on, and again, I'm sure he can figure out warranty details), and the possibility that it's sized wrong for the house (we really have no idea, but MMM has had it approved by a system designer and presumably thought about that). I'm not saying anyone has a responsibility to go to the MMM site and correct him. But if you're genuinely concerned that some aspect of what he's promoting is unsafe, and you would like to see it corrected, wouldn't that be a nicer thing to do than just posting a snarky comment here about what an idiot he is? Anyway, some people have posted helpful links and info, so thank you to them. Looks like some good information. I'll check it out. Analogies are designed to illustrate a point, not be extended to ridiculous conclusions. It's illogical to reason from an analogy; we reason from truth. Any truth reasoned to an extreme becomes an absurdity. If I extended your statement about a doctor being the only one qualified to do surgery to the extreme that you have about cooking your own food, etc, then we would have to conclude that I shouldn't remove a splinter from my finger because that's surgery and only a doctor is qualified! Your are indeed missing the point which was simply to show that you go to someone who's qualified when the need arises: i.e. You don't go to a mechanic to get a tooth pulled. Nor do you go to a G.C. to design a radiant heat system. Then you stated that Bob was suggesting that anyone who tries to work on their own heat was "a complete moron because it's beyond the grasp of anyone but the most highly trained and experienced people". You have totally fabricated this from your own mind. I challenge you to show where he said anything like that or implied it. By making such a false accusation, you have proved that you are obviously totally ignorant of what this site is all about. Just in this thread alone there are multiple posts by homeowners who state that they have received tremendous help from the pros here on doing repairs or installation on their systems. There are also thousands of pages of threads here that prove that your statement is outrageously false. Have you taken the time to read any before you start making such accusations? Obviously not. Your history shows that you just signed on today and your only posts are on this thread. You've also missed the point of why the pros on here are so adamant about the real issue which is: Mr. Mustache is pushing a system that not only is loaded with design errors, but is potentially deadly to those who follow his advice. But that doesn't seem to bother you. Instead, your upset about how some have commented about it. And you have the audacity to come on here where you've never contributed before and rebuke those who are genuinely concerned and who seek to warn others. This is America and Mr. Mustache is entitled to his opinion about how to design a radiant system just as we are. But he's not entitled to pass himself off as an expert and then promote that system in a public forum when that system is fraught with errors and potentially lethal. Freedom of speech doesn't allow that anymore that it allows someone yelling "fire" in a crowded theater. Why is it that you're more concerned about how we've expressed our opinions than you are about the issues with Mr. Mustache's system? Are you another one of the thought/speech police or do you care about real issues? that you speak of Kenoryn usually utilize tried and true materials and methods and benefit from Sweat equity . They on average do not try to re invent but save money by doing it themselves . MMM will soon find that the expansion tank he should have used was one meant for a potable water system , He will also find out that heat does not rise (lack of insulation ) nothing to show otherwise . His SUPER DUPER efficient condensing water heater will not condense nearly as much with 120* fluid entering it as it would with the manufacturer anticipated 55-60* water entering . He will go through pumps like a madman unless they are stainless or bronze . He will suffer from higher than normal air accumulation . Is that oxygen barrier tubing , not for use in potable systems ? He should really use poly propylene venting or at a minimum sch. 80 CPVC as we have now identified that PVC does not withstand the exhaust very well over about a decade . Internet companies that promote open systems usually end up defending those systems as is the case for the past several years , and you'll never see them out on a job site in jeopardy of being smacked upside the head , this is not by accident , a computer is easy to hide behind . Do you think the water in the radiant tubing will not breed nasties during the summer months or will hot water run through that tubing in summer heating the floor ? So much for no A/C . By the way , the men that frequent and comment on this site are the very best that exist in the design , consultation , installation of heating systems . We regularly solve horrendous problems from 100's & 1000's of miles away that the average guy cannot figure out standing in front of scratching his head . My guess is that we'll be assisting him at some point also . How's that for a diagnosis ? Just so you know , the average time in the field before you can even be considered a heating technician is probably a few more years than the average doctor spent in school and doing his residency . See the human anatomy has not changed in millennia , heating systems change all the time , we are kinda more like veterinarians , many different types of anatomies . A certain amount of experience and a written exam to be a plumber"
For what it's worth, I went over to this blog and made a post with a brief description of Legionella and how his system design has the capacity to kill people. That was my main concern. I didn't delve into the mechanical problems this system will have because I don't feel like writing a book. The problem is not so much in what Mr. MMM is doing, (he will learn) it is all the people that are reading and believing what he is telling them. One or two of these people could end up dead or gravely ill because of it. "Is your concern that it's not held at that temperature for long enough in a tankless system?" Not really. That 140 degree water will not stay that hot. As soon as it is circulated through the PEX it, by design, is meant to give up its heat. It is not the same as water in a closed loop system, it will be full of oxygen and will be a lukewarm bacteria incubator. Because it will be mixed with the same water MMM will shower with, he will be bathing in a soup of this water. In a proper setup there is a physical separation between the heating fluid and the domestic hot water side. BTW - I am a homeowner who has learned a lot from this site. Enough that I redid my entire heating system. These are some of the most helpful people on the internet. Sometimes you just have to humbly admit you don't know everything about everything. We've been discussing, and witnessing, the dangers of these open radiant systems since this site began 17 years ago. The attraction of that low price is still compelling, though. All we can do is continue to tell what we've learned. Not everyone will listen but we do know that we tried. Adults make decisions and deal with the consequences. "On top of that, hydronic heating is an art and science unto itself, with things like ΔT, GPM, BTU/hr, and R-value calculations involved. If you can get through all that, you’re faced with boilers that start at $2000, a complicated selection of parts that nobody except the experts really understands (you won’t be getting advice at Home Depot on building one of these systems), and all sorts of other hurdles. However, after digging through all this rubble, I found a few simplifications that bring the cost and complexity of radiant heat way down, to make it a DIY-compatible project for the average handy Mustachian." So, after digging through all the rubble he doesn't understand, he has found "simplifications" that do away with all the complexity that he doesn't understand, but has managed to convince himself is unnecessary. But somehow, if you DO understand all this stuff, you're compelled to use much more costly components than if you DON'T understand all this stuff, so the answer is clearly to NOT understand all this stuff - and save some money! 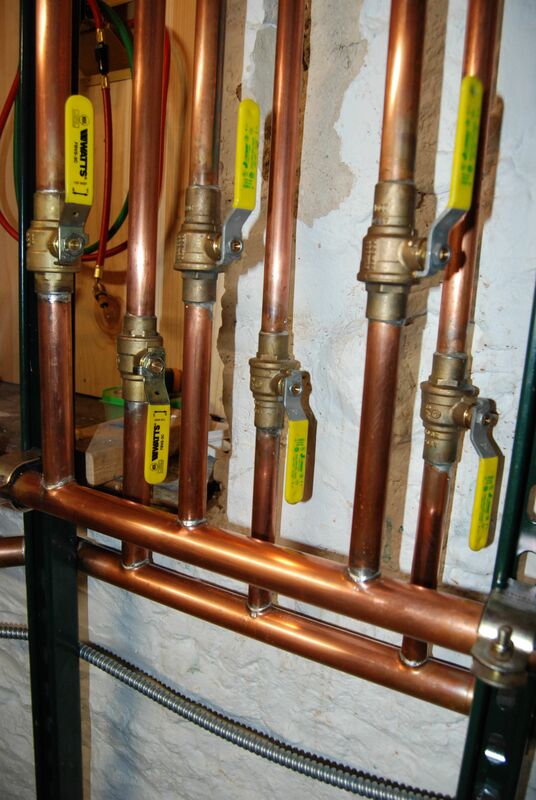 A properly designed heating system does not require a modulating condensing boiler, a hydraulic separator, multiple thermostats/actuators/valves/circulators/zone controllers, or miles of meticulously soldered copper tubing (unless it does, but how would he know?) It does require understanding "things like ΔT, GPM, BTU/hr, and R-value calculations involved." Oh, and head loss, too. Where I worked was an isolated place that is well known. People were always moving there to show us the error of our ways and to make money. The old timers used to say that they came on the afternoon boat with plans of making a pile of money. After losing their shirts, the left on the early morning boat, leaving a pile of unpaid debts behind and unhappy customers. They say about how far back you have to go to find a connection. One such person showed up with such plans from a State to the North. He found all these cheap "contractors" that wanted his services. He had figured out that Bock oil fired water heaters were the ultimate combo unit. We all wondered why he had to come South to work and why didn't just stay where he was from. As with all, there must have been a reason. A Bock oil fired water heater used as a combination system will start to fail after a year and you can't put hot enough water through it to work well as a heating system. Without causing premature failure. And the warranty is voided. After a short amount of time, he left on the morning boat, like most before him. A few years later. my wife and I brought her horse to go to a riding clinic in the same Northern State that the expert was from. When we met the father of the woman that owned the facility and we said where we were from, he asked my if I knew "so and so" who was a plumber where we lived. I told him that I had heard about him but didn't think he was around anymore. He then went on a rant about how the guy had done a heating system in their old farmhouse and they were on their 3rd Bock oil fired water heater and they couldn't find the guy. Like he had dropped off the earth. Bock Oil fired water heaters aren't New Yorker Boilers. When I started plumbing, 1964, they had been using oil fired water heaters in summer cottages so you could use the cottage for Spring and Fall heat. The tanks all failed and the potable/domestic hot water was scalding. Nothing changes. We learn by our bad experiences to not do something. Some youngsters have to learn the lessons we have. Which is sort of like the little boy wise guy who was watching a farrier hot shoe a horse. The farrier would heat up the shoe in the forge until it was cherry red. Put it on the horses hoof. Smoke and steam would rise up, the farrier would take the shoe and beat it on the anvil with a hammer to shape it. He's heat it up again and fit it, over and over until he was satisfied. The little boy watched intently. Finally, the farrier was done and threw the shoe on the ground to cool down and he could nail it to the hoof. The boy ran up and picked it up. He immediately threw it down and rubbed his hand. The amused farrier said "Burned you, didn't it". To which the wise guy boy replied :No, it just didn't take me very long to look at it". For some of us, our experience has made it so we don't have to take very long to know that something isn't going to work. Its that thing about "Unintended Consequences". That no good deed goes unpunished. I see where you are coming from now. That could certainly be interpreted as meaning he didn't understand those things and didn't try to. However, I didn't interpret it that way, based on my previous experience with MMM: he usually researches things thoroughly, enjoys learning about those kinds of things, and since he has a technical background (he's an engineer) I'm sure he would have no problem with them. In this case, what I had assumed was that the had done the research to try to discover a system that his readers, often fairly handy DIYers, would be able to tackle. He was doing the heavy lifting in research and understanding and passing down what he learned about what was the simplest kind of system. But, I could be wrong. Anyway, none of that is really important. It's just that the tone of that post, and a few others here, has been very condescending and insulting, and it set me off. I reacted inappropriately with a similarly condescending remark to the OP. I think we could all benefit from more civil discussion so I apologize for being uncivil myself. Regarding the nature of the comments, and people's desire to help: expressing your opinion here about MMM's competence or lack thereof does not in any way help or improve the situation. It will in fact have no bearing whatsoever on whether MMM modifies his system design, or whether other people follow his advice. So I don't think the people complaining here are doing so in an attempt to improve the safety and protect people. They are just complaining. If they were concerned about incorrect information being promulgated, and wanted to improve the safety of the system, they'd pop on over to the MMM comments section and raise a concern there. No need to sign up or anything, so it wouldn't take them any longer than posting the comment here. Anyway, thanks very much to Harvey/Chris who have done that. If you check out the MMM article again you'll see he's made some additional comments/acknowledgements of reader concerns and concerns raised on this forum.